One troop of First Hussars tanks commanded by Lt. W.F. McCormick made it all the way to the north edge of Secqueville-en-Bessin on D-Day. 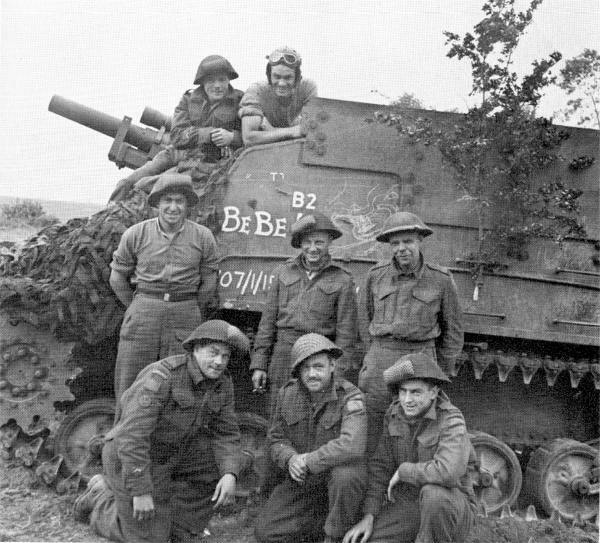 The troop had probably got closer to the final objective than any other element of the Allies' seaborne assault forces, but finding themselves isolated without infantry or anti-tank support they retraced their steps and rejoined the regiment. From left to right: O.K.Hunter (Gunner), A.Perkins (Driver), Lt. Bill McCormick (In charge), J. Pritchard (Driver), Edison Pollock (Loader). 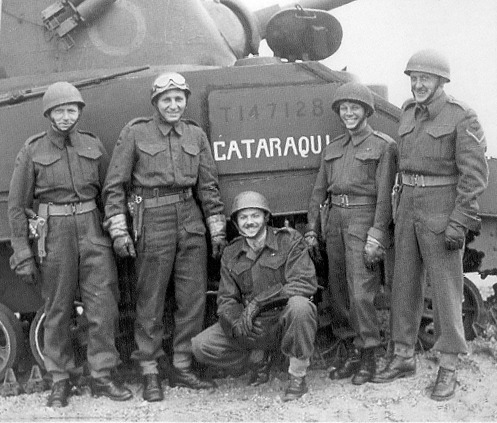 14th Field Regiment crew standing in front of a "Priest". 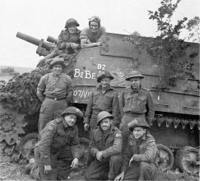 The Priest was a self-propelled gun used by the Canadian artillery regiments. The 105-mm howitzer fired a 33-pound high explosive shell up to 11,500 yards and could also be used against tanks. 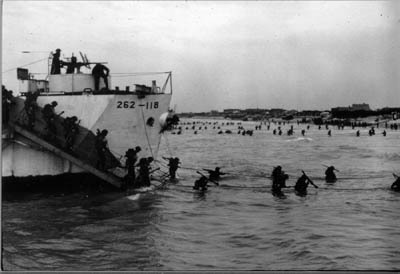 B Squadron, Fort Garry Horse, landed at 'Nan White' beach near Bernières in support of the Queen's Own Rifles. 'B' Squadron did a loop back patrol from Beny-sur-Mer past Fontaine Henri down to near Thaon and then back east to Anguerny. At about 15:00 they reached Hill 70 and could see the Carpiquet airfield. 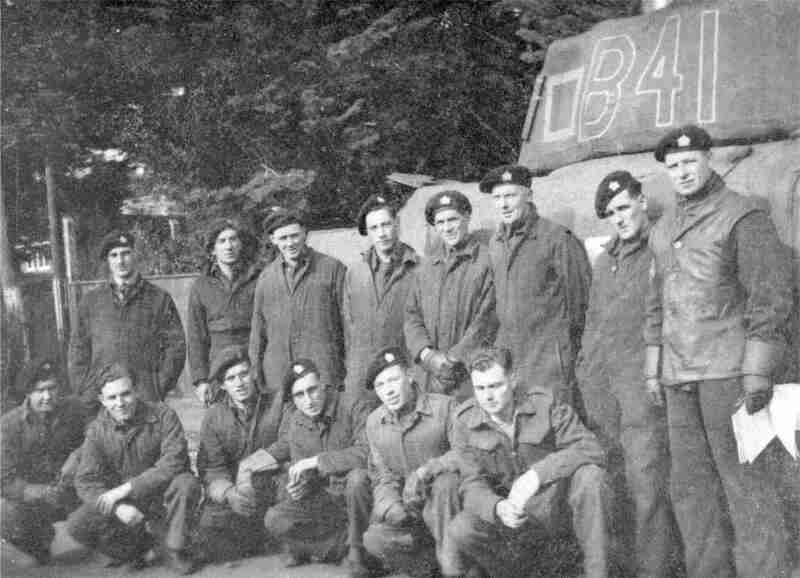 Lt Brown's tank was hit while racing towards Hill 70 and he became the first officer to be killed in B Squadron. 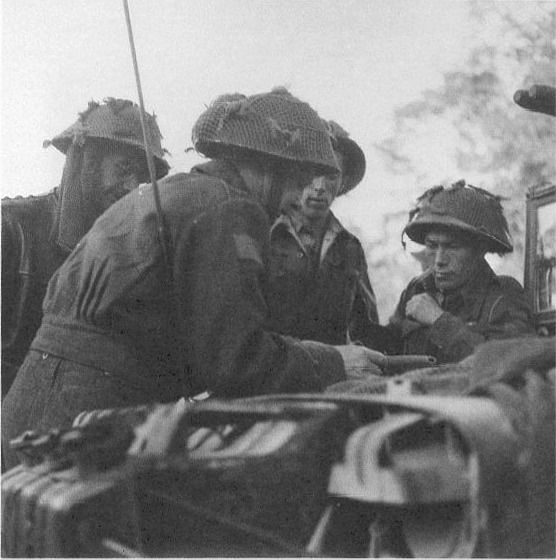 Lt. Stan Biggs briefing Universal Carrier flame-thrower crews of the Queen's Own Rifles.